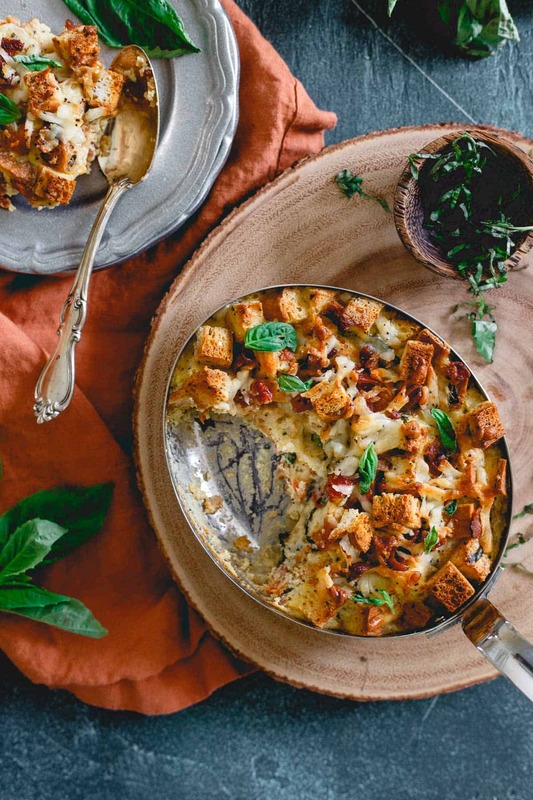 This everything bagel breakfast strata is perfect for Mother’s Day. With bacon, cheese, basil and sun-dried tomatoes it’s a delicious gluten-free brunch! I’ve never been a brunch person. I honestly don’t know why but we just never did brunch as a family for any holiday, even the ones that lend themselves to the meal like Easter or Mother’s Day and so it just never really became a “thing” for me. *This post is sponsored by partner, Udi’s Gluten Free. But then for my job, I spend every day looking at food either on blogs, Instagram or Facebook and come across some seriously EPIC brunch creations that I decided this brunch-less life I’ve been leading needs to change. Last month I went out to what might be my first legit brunch ever on a Sunday with some girlfriends, stuffed my face with oysters, a poached egg caesar salad, duck confit hash and some pretty delicious bloody marys and now I literally want to punch my self in the face for missing out on this amazing mash-up meal for the past 35 years. With Mother’s Day right around the corner, the holy grail of all brunch holidays, it seemed appropriate for my next post with Udi’s to get my brunch game on. Their everything inside bagels are one of my favorite products (toasted with some cream cheese is my go-to post workout carb feast on weekends) and when the idea came to turn them into a breakfast strata, I knew it was going to be the kind of dish that blows everything else on the brunch table out of the water. 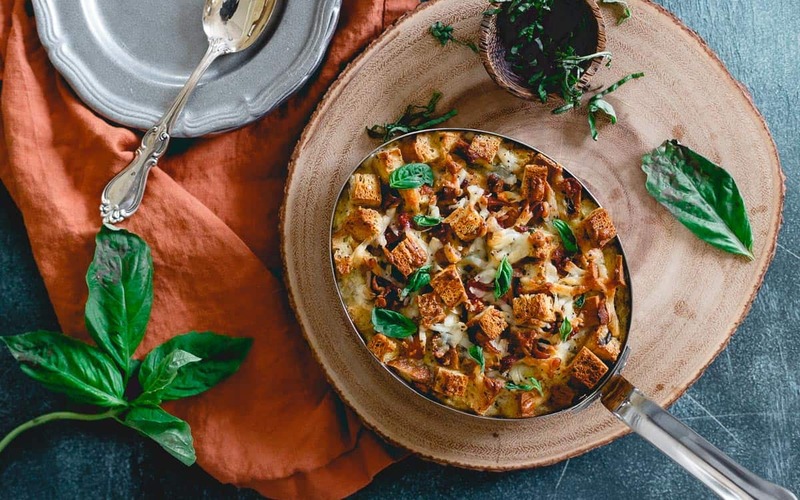 The everything bagels alone with some eggs, milk and cheese would be enough to make me happy but with the addition of bacon, basil and sun-dried tomatoes, this breakfast strata is the perfect balance of savory comfort food and fancy holiday recipe. 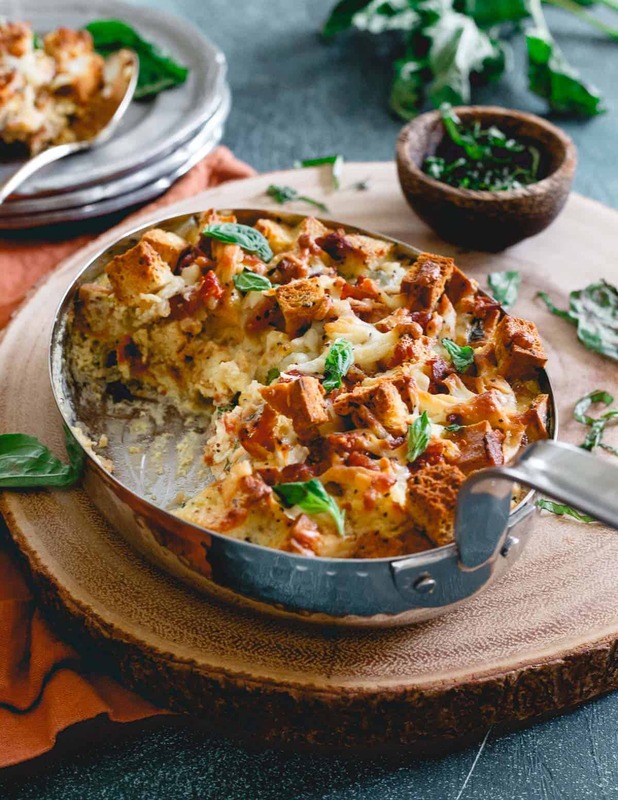 And while I’m pretty sure any mom would be happy to see this everything bagel breakfast strata on the table to celebrate her special day, nothing says you can’t just enjoy it for any weekend brunch all year round! Preferably with a Bloody Mary. Or two. Check out the sweet cousin of this breakfast strata, last year’s chocolate strawberry bread pudding — also made with Udi’s so it’s gluten free too! This everything bagel breakfast strata is perfect for Mother's Day. 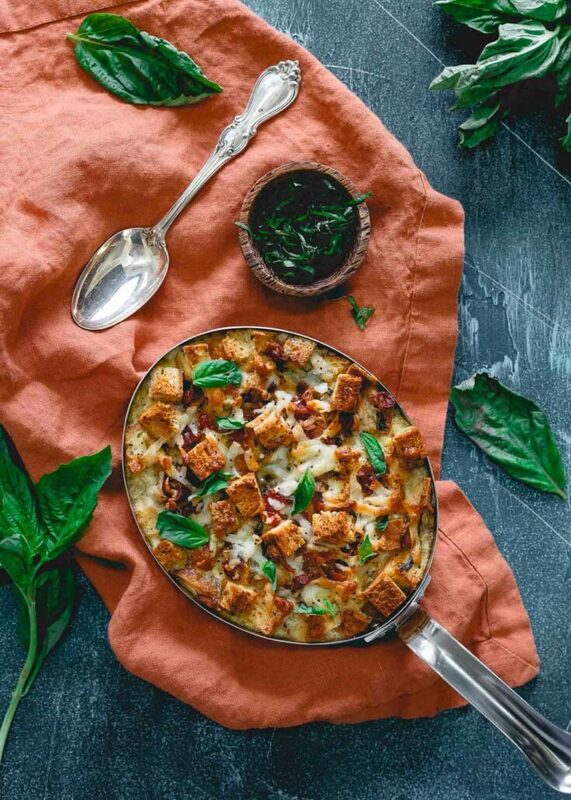 With bacon, cheese, basil and sun-dried tomatoes it's a delicious gluten-free brunch! Toss cubed bagels and melted butter together, spread out on a baking sheet and bake for about 10 minutes until toasted. Meanwhile, heat a skillet over medium-high heat. Once hot, add bacon slices and cook until crispy. Transfer to a paper towel lined plate reserving the bacon grease in the skillet. Crumble the bacon once cooled. Add the diced onion to the skillet with the bacon grease and cook over medium heat until softened, about 5 minutes. Whisk eggs, milk and half of the cheese together in a medium bowl. Place the toasted bagel cubes, sun-dried tomatoes, basil, cooked onions and 3/4 of the crumbled bacon to a large bowl. Pour the egg mixture into the bowl and toss until well combined. Pour the mixture into a baking dish. Top with the remaining cheese and bacon and bake for about 30 minutes until set and top starts to brown. Looks good, except you left the eggs out of the ingredients. How many? Oops! Thanks for letting me know. It’s been updated. 6 eggs for 4 servings. I’m a HUGE brunch fan Gina! I love, love, love this strata! Can’t wait to make it for my husband because I know he’s going to love it too. Totally awesome video ! This is the perfect breakfast any day of the year! 1. I LOVE that you made a strata with everything bagels. 2. LOVE the sun-dried tomatoes addition! Now this is one delicious reason to schedule a brunch ASAP!! Fabulous strata!!! Brunch is one of my favorite meals! I want this for Mother’s Day! yum!!! You had me at “everything bagel.” I love that this is gluten-free! I love a good strata and my kids love everything bagels. Win win! YAAAASSS!! This is my dream come true! Everything Bagel + Strata = ???? Oh my gosh, I love this recipe. This strata is beautiful. I could eat this for breakfast, lunch, and dinner.